Canadian Mint Manufacture Spend Opportunities? Frequent Miler posted about an opportunity for Canadians to purchase collectors coins at face value, then redepositing or cashing them out at a bank. 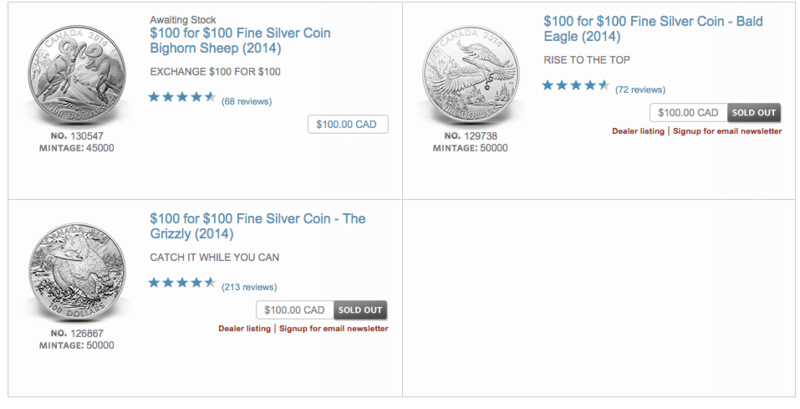 The Canadian Mint occasionally has silver coins which sell for their face value with free shipping online, which are available here. These coins have been around for awhile, so it’s not the first time I’ve heard about them, but I think it’s not worth the time and effort to manufacture spend, especially with the lower amounts and no category bonuses. It’s very easy to work out the numbers. There are currently ten coins available for sale. You can purchase three of them per household. The total value of these coins add up to $1500. That’s of course assuming they’re not sold out. So say you were able to get all of them. On unbonused spend, I’d be using the American Express Platinum Card to earn 1.25 points per dollar spend. You could also use your Starwood Preferred Guest American Express depending on how much you value your Starwood points. That means you’d get around 1800 Membership Rewards points. At most, I’d value them at 1.7 cents since there are pretty much no-hassle methods to acquire similarly valued miles for less. That means those points are worth around $30 bucks. You’d just wait for them to ship, and then cash them out at your bank. Since there’s free shipping, and no fees of any sort, the points are absolutely free. The only cost is your time. I’m guessing it’d take 1-2.5 hours to do this process, so just even from that, your time is probably worth less than $20 bucks an hour, which honestly isn’t very great – especially since you’re getting miles instead of cash. This is, of course assuming you’re actually able to cash them out because you won’t run into a stubborn bank, you’re able to purchase all these coins, and there aren’t any other logistical problems associated with receiving and transporting your coins. You can’t get SPG for 1.7, but I’m referring to stuff like Aeroplan, Hyatt, KrisFlyer, Avios, and everything really, except probably Alaska and SPG. There is a CM branch in Vancouver on Granville St. I went in and asked about the $100 silver coin for $100 and they said the limit is 3 per person, per household, per day. I was with my son so they said I could purchase 6 coins.